Here's a multichannel SACD player, competing on the strength of its CD performance. 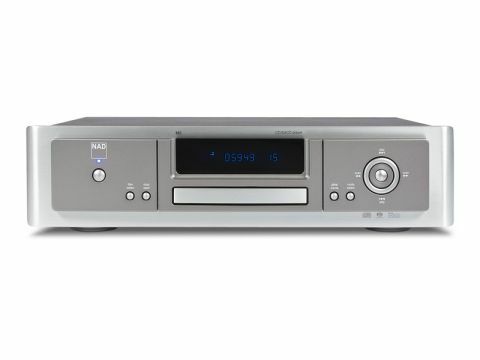 Although it should be noted that the NAD M5 offers the full gamut of SACD replay, stereo and 5.1, complete with bass management and a video output for use in setting up (though an external display's not actually essential). That much will already make it appeal to lovers of true high-fidelity surround-sound, but there's plenty more behind the attractive all-metal fascia. One of the most interesting features is the two small metal enclosures towards the rear of the audio board, which house NAD's own 'Class A Low Noise Line/Drive Amplifier' modules. These replace the more common op-amps with configurations built up from discrete transistors, including some power devices which use the screening cans for heatsinking. These promise low distortion and high current and drive the main stereo outputs – both the phono sockets and the balanced outputs on XLR connectors. Another unusual feature is the inclusion of both linear and switch-mode power supplies, for analogue and digital parts respectively, a combination we don't recall seeing before. High-quality DACs provide conversion, with the multi-channel outputs being buffered by op-amps. The transport is separately screened internally, while the front panel display is informative but occasionally a touch confusing, we found. Presented as a CD player, the only way we could fairly compare it with the rest of the group – the M5 drew a rather lukewarm response from our blind-listening panel. They liked its smooth detail in the orchestral track particularly, but were underwhelmed by its slightly lackluste rhythm and general lack of panache. There are good points, though, including decent rendition of voices and a nice sense of flow to mostly melodic music. Actually, more dramatic and punchy stuff is quite well-served too, especially in the specifics, with good bass extension and control married to open, natural treble. But there's no denying that the overall result doesn't quite gel. This makes it paradoxical that the SACD performance seems to be considerably more assured. Although it was not part of the formal listening, we did try a small section of an SACD with the listening panel present and there was unanimous agreement that the SACD layer sounded clearer, more precise, better timed and altogether more involving than the CD. In fact the difference was so big that we suspected the disc had been mastered differently for the two layers, but that's easy enough to check and turned out not to be the case. Subsequent listening to a handful of SACDs confirmed that the performance with the high-res layer exceeds that of the CD layer by far more than the usual margin. This is also one of the most attractive SACD players we've come across in some time.